Bhubaneswar, April 1 (IANS) BJP President Amit Shah on Monday urged the people of Odisha to uproot the Naveen Patnaik government and bring the saffron party for the development of the state. "I urge the people of Odisha not to repeat the mistake of electing the Biju Janata Dal (BJD) once again. You have given 19 years to the BJD and also the Congress for a long period in the past. 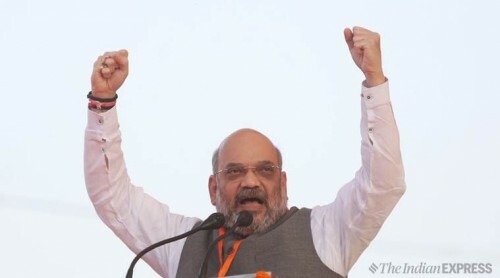 Give the BJP a chance here, we will make Odisha the number one state in five years," Shah said in Paralakhemundi, Gajapati district. The Bharatiya Janata Party (BJP) President began the election campaign in the state by alleging that the Patnaik government has "done nothing except corruption". Shah criticised the Chief Minister for his poor understanding and enunciation of the Odia language. "It is unfortunate that Naveen Patnaik can't speak Odia language. Elect a Chief Minister who will understand your language, feelings and emotions. How can someone who doesn't know Odia solve the problems of the Odia people?" he asked. The jibe came on a day when Odisha is celebrating "Utkal Divas", the formation of the state as a separate province on April 1, 1936. Shah said that many people were migrating to places like Surat in Gujarat as employment opportunities were lacking in Odisha. He assured that employment opportunities will be created in the state if the BJP comes to power in Odisha. He also alleged that Patnaik's attitude towards western and central Odisha was "step-motherly".